Port Muhammad Bin Qasim is located at geographical position 24.46 N, 67.21 E, 35km away from city centre of Karachi. This is the second largest port of Pakistan after Karachi and it is relatively a newer port providing services to the ships using the port facility through a number of dedicated terminals/wharves for loading & discharging various cargoes. It handles a wide range of general, bulk, bagged, containerized and liquid cargoes. Port Qasim is tidal port and access is made thru a 25nm long well marked entrance channel with a min depth of 12.37M at the entrance and 11.00M at the inner basin area. The ships are generally piloted using two tug boats during day light only. However, ships with max length of 202M equipped with Bow Thruster & operational GPS, subject to prior approval from Port Qasim Authority are piloted during dark hours as well. The only State of Art Terminal & Storage Facility for Bulk Liquid Chemicals & LPG in Pakistan which provides world class services to the growing chemical & petrochemical industry of Pakistan facilitating the ships to dock through its 225M Pier with a draft of 11M. The Terminal at Port Qasim handles almost 90% of the vegetable oil imported in Pakistan through its well built ship docking facility and Well laid pipe lines. The ships with 45,000 metric tons deadweight and 10.00 meters draft discharge their cargo into the adjacent custom bonded shore tanks. The FOTCO environmental friendly oil handling facility, capable of handling aprox. 9,000,000 million tons of petroleum products annually, includes the state of art docking facility equipped with two product pipelines (furnace oil/diesel & crude oil), caters the ships of 75,000 DWT & LOA of 245M. The FAP Terminal which commenced operation in 2010 has revolutionized handling of bulk grain & fertilizer cargo in Pakistan. The facility of international standard capable of handling around 4,000,000 million tons annually handles ship loads (import & export) of 75,000 DWT, LOA 230 meters and 12.80 meter draft though Mechanical Loaders into silos or warehouse. 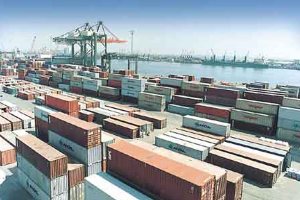 QICT strategically located at Port Qasim covering a total area of 12 acres handles about 70% of trade of Pakistan. The total quay space of 1,327 meters and max draft of 13 meters equipped with 09 units of post & super post panamax gantry cranes with sufficient yard container handling equipments can cater 4 ships simultaneously. Besides the designated terminals, there are 04 berths covering a total key space of about 410 meters with permissible draft of 10.00/10.50 meters used for load/discharge of conventional/dirty cargoes not accepted by the dedicated terminals.